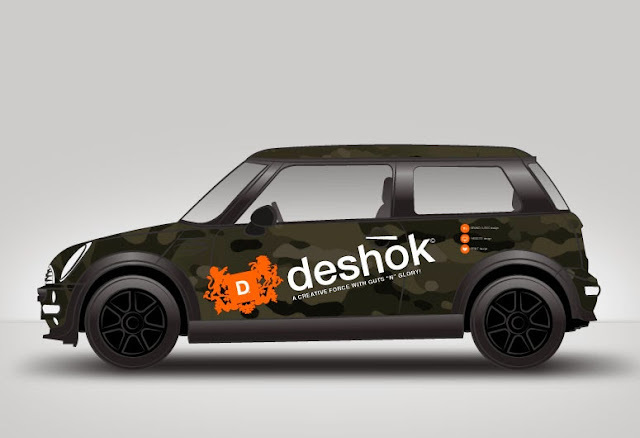 DESHOK MARKETING ASSETS - "CAMOSHOK". 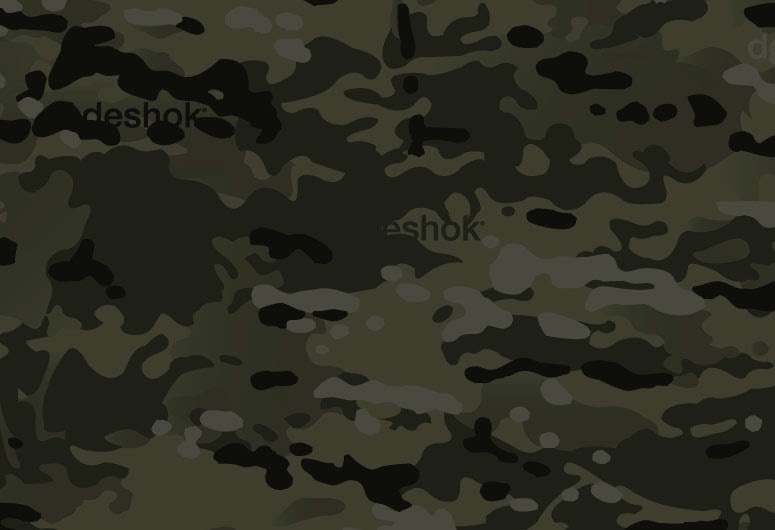 Over the the past months Deshok has been going through a bit of a brand transformation, most of which is a beyond the scope of this post but as part of this re-branding exercise I decided that I would like to create a texture that can be used as a background in a multitude of circumstances. This texture could be used as cover for brochures or the background for a business card, computer and website wallpapers or even wrapped around a Mini! I had a little play with visuals such as sheet steel, rusty metal concert and carbon fibre in the end I settled on camouflage or to be more specific, MultiCam. 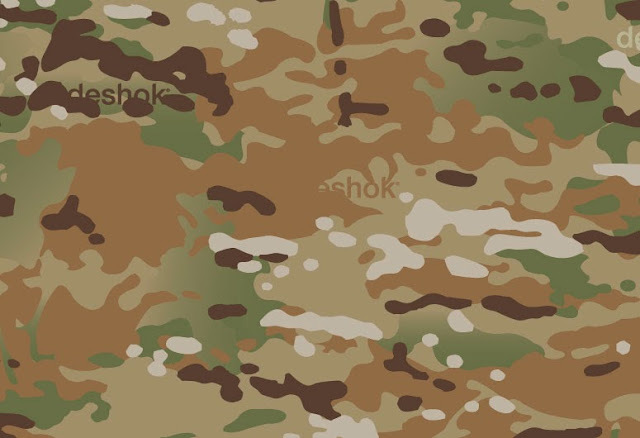 This is the bang up-date-to-date camo that is currently issued to to the British army in fact it is issued to all major armies keen on keeping their personal safe. Just to copy the existing and © Copyrighted MultiCam was not an option, I wanted to put a slight Deshok twist to it. So how did I do this? Firstly and using some genuine MultiCam as a guide, I drew out all the elements of the camouflage in AI, creating a layer per colour, 5 in total. This was longest part of the project but I felt important to get right. 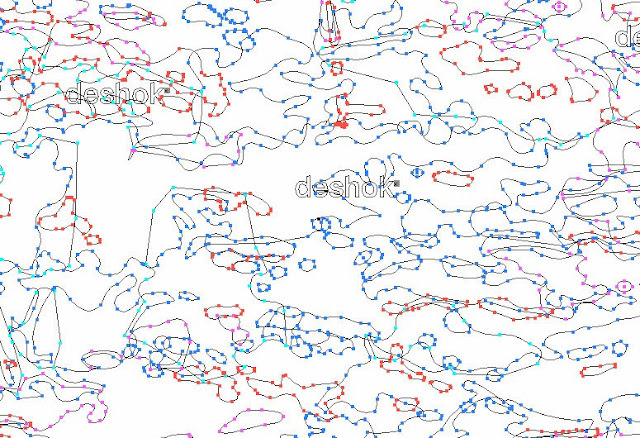 You will notice that I have included the Deshok brand to some of the colour layers. 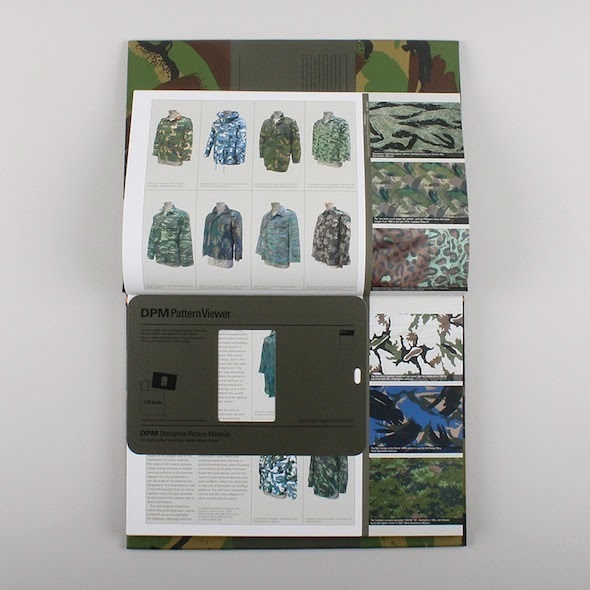 Above is quite close to the original MultiCam colour ways. This didn't seem right for my purposes. To start with and so I had visual base to work from I used close to the original colours. The finished item did not look right for my needs at all so in the end and after much faff I decided on subdued olive green hues. This works very well with white Deshok brand and the orange of the Deshok skills icon set and the Gut "N" Glory crest. As this was produced as a vector based AI illustration I can enlarge and scale as much as I need and it will always look great. Like -wise, it can easily be dropped into Photoshop and saved out as .jpg .png . eps etc for use on line and off-the-page. Above a test piece to see how it will look in action. 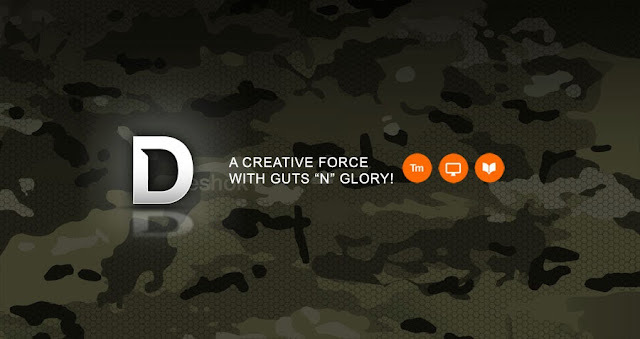 Find out more about genuine MultiCam visit the MultiCam site at the link below. Managing Director - Deshok.com IS A SPECIALIST WEBSITE & DIGITAL DESIGN AGENCY FOR AEROSPACE, DEFENCE & SECURITY SECTORS U.K.
A while ago I was asked to come up with concepts for a new website for the Bronco soon after to become the Warthog - All terrain protected mobility vehicle. 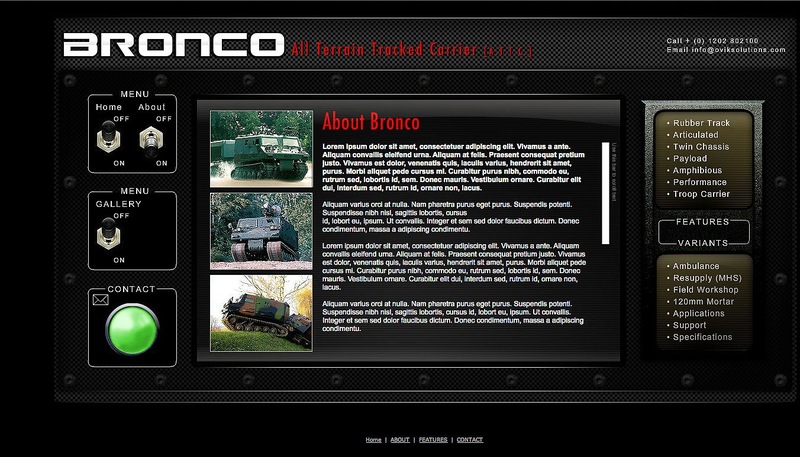 The idea I came up with for the website interface was to replicate the cockpit of the Bronco, giving the visitor the look and feel of actually siting the vehicle and driving it. using cockpit instruments as buttons to navigate to other sections of the site and having content project its self (heads-up-display styley) on the windscreen. 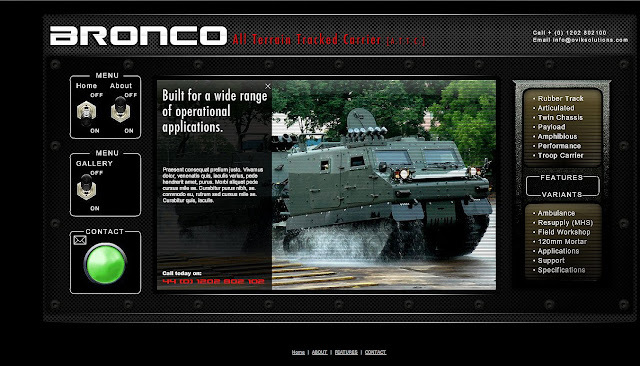 The client loved the idea but unfortunately as with most concepts reality rained me in, never-the-less I did get to fulfil childhood dreams and clime all over this most awesome of armoured utility vehicles. These pictures were for reference purposes, to help me with the interface design. In the end this project never-saw-the-light of day however, the concept or rather part of it did find its way into another project for the same client so if you like, the son of Bronco lived on. Home page featuring flick switches and press buttons from the vehicle. About page features more text as required but images were clickable to view much larger. Click the link below to see how this concept was re-imaged and re-used for another vertical in the companies portfolio. A very clever application of the term, waste not, want not! 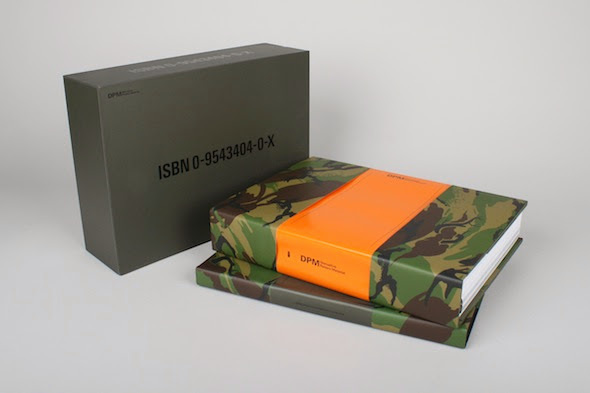 It seems like a thousand years ago now but I used to visit this cool street fashion shop in Bournemouth and moon over a book they had there, called: DPM - DISRUPTIVE PATTERN MATERIAL: AN ENCYCLOPEDIA OF CAMOUFLAGE by Hardy Blechman head designer at maharishi, a company he founded in 1994. A beautiful object but at £400 a bit out of my budget. But why so expensive? I suspect it was limited edition with a small print run and the production values were beautiful. Full colour though out many many spot colours, Matt laminated with spot UV varnish. 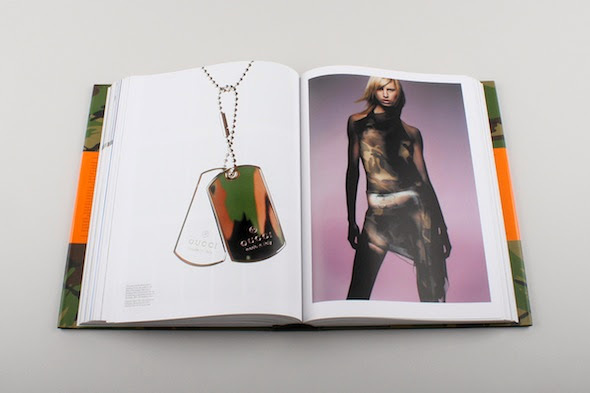 This was a coffee table book of 2 parts and came in beautiful box to protect your investment. I have been able to find the book for sale on Amazon usually pre-owned and going for upwards of £1400 mint condition you understand but you see what I mean by investment. DPM : Disruptive Pattern Material is Hardy Blechman’s exploration into the vast world of camouflage, drawing on the knowledge of an extensive team of consultants the encyclopedia charts the history and theory of camouflage from its original concept in nature, through to its adoption by the military and on to its popularity and use within modern civilian culture. So if anyone is looking for an excellent birthday or Christmas gift idea here you go, other than that, Id better start saving my pennies. 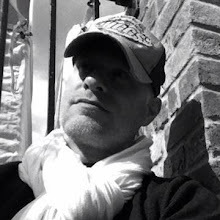 Copyright © 1996 - 2018 Neil Stevens, Deshok.com. All rights Reserved. Property of Deshok.com. 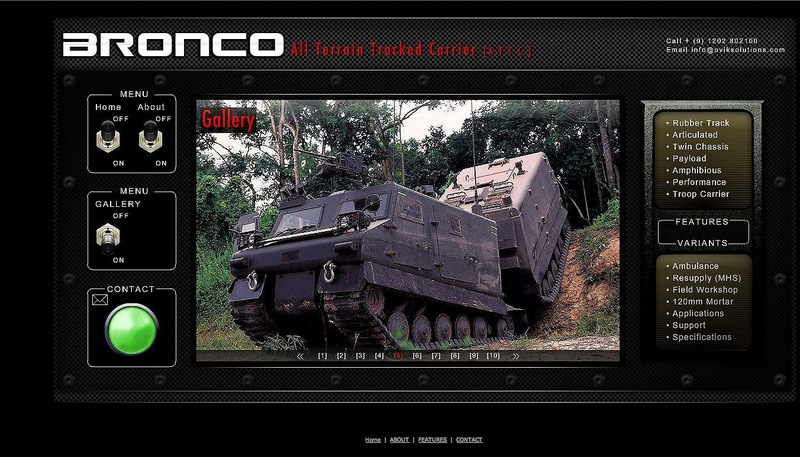 Use of this website is strickly for review purposes only.